Unfortunately, Fetal Alcohol Spectrum Disorders (FASD) are probably much more common than previously thought! FASD is a term used to describe a wide range of effects that can happen when alcohol is consumed during pregnancy. Often “hidden”, they may not be visible immediately in a baby. For instance, struggling with learning, managing behavior, and handling responsibility may not be apparent until a child gets older. Earlier this year a study was published in the Journal of the American Medical Association showing that perhaps as many as 1 out of 20 people have FASD, a much higher percentage than previously thought. This study took a different approach by evaluating first-grade students from four different regions in the United States. While more research is needed, we have reason to be concerned that more people experience struggles in life as a result of something that could have been prevented simply by increasing knowledge. How much alcohol does it take to cause harm? According to the Surgeon General of the United States, as well as all major medical associations, no amount of alcohol has been proven to be safe to use during pregnancy. 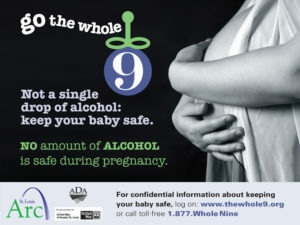 If no alcohol is consumed during a pregnancy, a person is completely protected against FASD. No amount of alcohol has ever been proven to be safe to use during pregnancy. Wine IS alcohol and presents the same risks as beer and hard liquor when used during pregnancy. Alcohol is potentially dangerous during ALL stages of pregnancy, even in the very early stages. Learn more about the St. Louis Arc’s FASD prevention program.